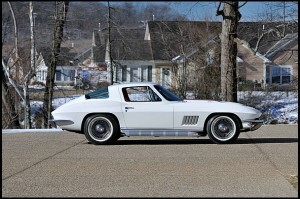 1967 Chevrolet Corvette Coupe Unrestored with 2,996 Miles for sale by Mecum Auction. Click through and read the story – it’s the apocryphal “drove it for a bit, then put it away in a barn” story. I’ve mentioned before, or maybe it was in a paper, that I am a car guy. Have been for a long time. Longer than I care to mention, really. Can’t help it – it’s generational. Although the ’67 Corvette has LONG been my favorite this one, despite having all the “good” options (427 cu in/390 hp, factory side pipes, Kelsey-Hayes knock-off wheels), isn’t quite what I was looking for. I’d rather have a Marina Blue convertible without the stinger on the hood scoop … which is probably just as well since I expect this one will fetch over $2,000,000 when auctioned in April. 2014-04-12 UPDATE: I was way off. Final bid was $725,000. Had I known that I’d have bought two!! What a beauty! Maybe I should buy a car now, never use it, and then sell it in 50 years… Then again, cars may not even be an option then.